In a major catch, City Task Force Police on Monday busted a ganja smuggling racket. The gang was all set to transport ganja in train through rail cargo to Delhi. The police arrested four persons, including a transporter, while the kingpin and another accused are yet to be nabbed. The police seized 303 kg ganja stuffed in boxes, which were labelled as couriers/parcels. The arrested have been identified as E. Dhana Raju (33) alias Raju alias Rana, a native of Rolugunta mandal and resident of Addu Road under Nakkapalle Police Station limits in Visakhapatnam district, Atta Lova (31), resident of BB Patnam in Rolugunta mandal, P. Durga Babu (44) of Anakapalle and T. Venkata Ramana (42) of Railway New Colony, Visakhapatnam. According to reports from CTF, Dhana Raju has been involved in ganja smuggling for a long time. He was befriended by one Murthyand they planned to make some easy money through ganja smuggling. Murthy had taken Raju to Delhi, where he introduced him to another Siva Sankara Sahani alias Gowtham Bhai alias ‘G’ Bhai, who asked him to start transporting ganja, for which he promised to pay ₹4,000 per two kg. Police said that Dhana Raju used to shift the contraband with another Atta Lova to Delhi through road transport. Recently, the gang started to think of a new modus operandi for smuggling ganja, as smuggling by road became difficult. It was then that the main accused Siva Sankara Sahani introduced T. Venkata Ramana, who is running a courier service in name of TVR Transports & Rail Cargo near Sri Kanya Theatre at Railway New Colony, to Dhana Raju, Lova and another Durga. They hatched a plan to transport ganja through train cargo and pay ₹300 per kg ganja to the agent Venkata Ramana as commission. 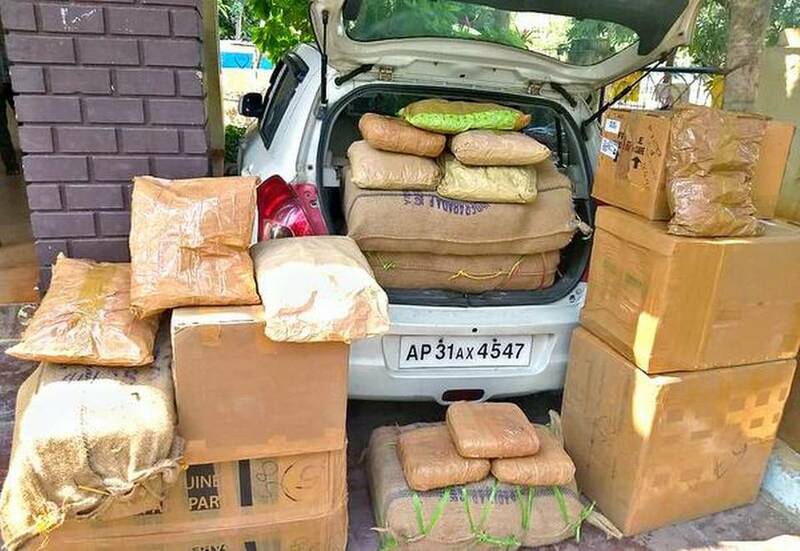 On Monday evening, Dhana Raju and Lova procured 252 kg ganja from Agency area and brought it to Vizag in a car and handed it over to the agent. Other accused Durga also brought 42 kg ganja. While the trio were waiting near Railway New Colony, the CTF team along with IV Town Police, acting on a tip-off, arrested them. ACP CTF Mahendra Mathe said that the main kingpin and another Murthy is yet to be nabbed. A cash of ₹2 lakh, six mobile phones and a car were also seized.